meadow of Tal Wi Wi. at 3200 sq. ft. so there is room for everyone. that, too. There is a lodge right next door. dozens of activities without ever leaving the property. gently swinging in one of the hammocks. Extra refrig/freezer, coffee grinder, 2 extra folding tables, 18 extra folding chairs, woodburning stove (in addition to fireplace). books for adults and kids, tons of board games, hiking books and maps, bird books and binoculars, canoe, paddles, life vests. Charley's Mt. 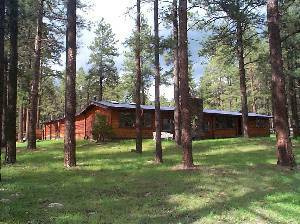 Retreat is a cozy cedar home wrapped around a courtyard nestled among the tall ponderosa pines. 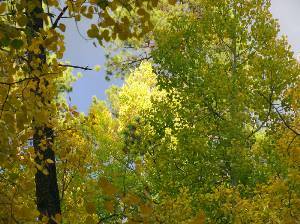 Every season has something to offer at Charely's Mountain Retreat. You'll find everything you need in this well-stocked, modern kitchen...even for large groups. Even summer nights are cool enough for a toasty fire set in a grand rock hearth. Gaze at the beautiful meadow through the large picture windows while sipping morning coffee at the dining room table. You are surrounded by millions of acres of national forest at Charley's. Just walk out of the house and into the forest for a seasonal treat. 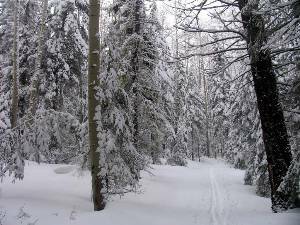 Snow abounds for sledding, snowman building, cross country skiing, snow shoeing, photographing and more. At 8,000 feet above sea-level, this place is a bona fide escape from the heat, way more than Sedona or Pine or Pinetop or even Flagstaff. 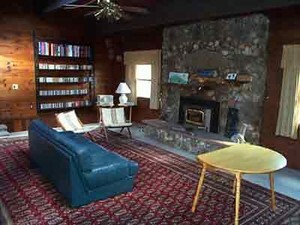 The house is surrounded by tall pines with a great view of a meadow from the dining room. Lots of room inside and out, and plenty to do. The house is well equipped with kitchen supplies, music, board games, ping-pong, outdoor toys--pretty much anything you'd need for an extended get-away-from-it-all, no-TV stay. And there's so much to see and do in the area. I strongly recommend the hike up Escudilla, the west fork hike to Mt. Baldy (great even if you don't go to the top), the hummingbirds at the bait shop at Luna Lake, or just walking the country lanes from the house. This is an awesome place to stay. We sta here every year and Love it. We visited Charley's Mt. Retreat in Alpine on July 27 - 30, 2005. 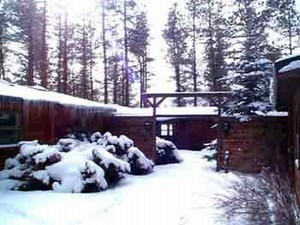 This was a repeat trip to wonderful Alpine and Charley's retreat, my first being in 1979. And, as before, it was beautiful. The cabin is always so clean and comfortable. It is also so large that one can easily find a little niche away from everybody else for a little quiet time. 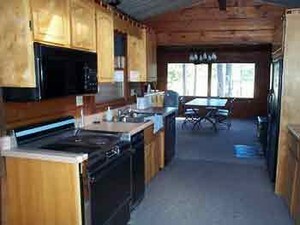 The cabin is well appointed with a full kitchen and BBQ grill for the master chefs. There are plenty of linens and the baths are very nice. Being next door to the Tal-Wi-Wi lodge is also nice for a little evening after-dinner getaway. Alpine is also a wonderful place to visit. Hiking, fishing, and wild animal watching are all so easy to do. We went to the Hannigan Meadow area for a short hike through the Blue Range Primitive Area and again, it was just beautiful. You will love this place and the area. We plan to try to come back in the winter for a litte winter recreation. Phoenix Sportbike Club has stayed at Charley's Mountain in 2003 and 2004 for a week at a time. The cabin has been awesome for our group to use as a staging point for rides up and down the 191 and in the surrounding area! Everything you need is right there or very close by, and there's tons to do int he immediate area! Jenny has always been very gracious and helpful in getting things ready for our trips up there! We're looking forward to making a return trip sometime in 2006! I've taken my 4th/5th grade class to Charley's Mountain Retreat in Alpine for their graduation trip for the last five years. It's a comfortable space for roaming and exploring, with lots of opportunities for children and adults to be in nature. The cabin accommodates a large group of people easily and is well equipped. The scenery is breath-taking and the nearby hike up Escudilla Mountain is a hit with everyone. It's a place where stories are born that remain in the hearts of visitors for years to come. I highly recommend it. Stayed here over a 4 day weekend in June. 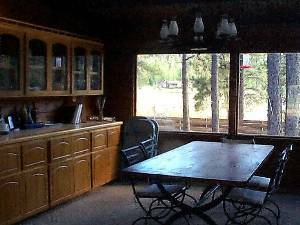 A great cabin, awesome location all the amenities of home! Thanks to the owners for providing such a sweet place! Ask about our current specials on winter visits (does not include Thanksgiving, Christmas or New Year's Eve stays.) Stays of less than a week are welcome! For stays of four nights or less it is $300/night for up to six people. For stays of five or more nights, it is $250/night for up to six people. More than six people is $10/day/person; Please inquire about special rates for large groups with lots of young children. Pets are possible with prior approval only. No smoking in the house please. Deposit: 50% plus $100 cleaning fee. Reservations are held for one week pending receipt of deposit and $100 cleaning fee. Balance due within 21 days of occupancy date. Cancellations and Refunds: Cancellations made prior to 21 days of the date of occupancy, full deposit refunded minus $100 processing fee. No refunds on cancellations made within 21 days of occupancy date. May consider applying to future reservation. Other Fees: Pet deposit; prior pet approval required. Required Stay: Less than a week? Inquire.